Fabrics woven on handmade looms. Stitched and tailored together by hand. 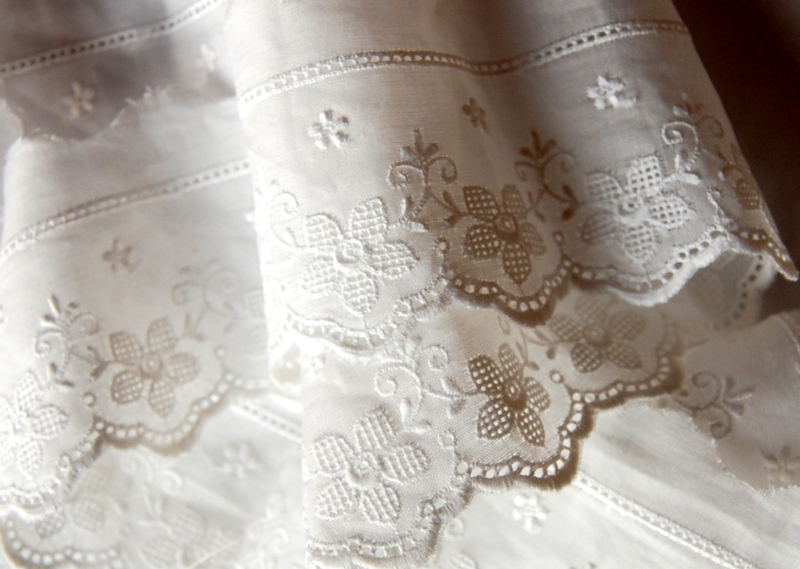 Delicacy of needles and thread, interlacing the smallest of stitches; running, plain, cross, chain, top, back, to create, to form. The makers lives woven, embedded into garments as they are patiently crafted. Thoughts, hopes, reflections and dreams, transmitted from head to hand, heart to fingertip, to stitch, to clothe, sculpting shapes into amazing structures to mould, shape, hold, protect the body. Impermeable and poised. Architectural undergarments, erected like monuments; corsets, hoop skirts, pantaloons. Bound in, with, sensitive engineering. Dresses and petticoats with hugs swathes of fabric, falling and cascading, transforming human forms into embodied, walking sculptures. Gathering stories of time that no seamstress knew she ever telling. A whisper in every fold, an echo in each ruffle. We ripple in their wake.